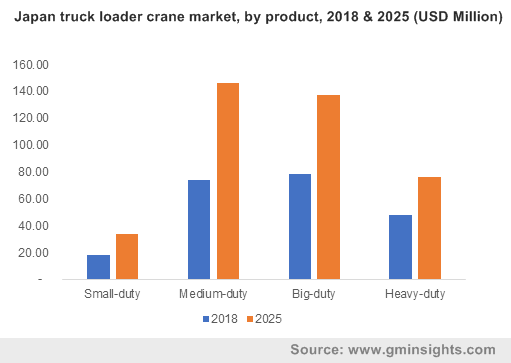 The Truck Loader Crane Market size was valued at around USD 1.5 billion in 2018 and is expected to grow at a CAGR of over 9% from 2019 to 2025. The global shipments are expected to reach over 170 thousand units by 2025. The truck loader crane market is defined as a crane consisting of a fixed telescopic boom, rotating superstructure either turntable or center post, operating machinery, and operator stations, which are frame attached & mounted on the commercial truck’s chassis supporting payload hauling capabilities. The scope of the research involves stiff boom and knuckle boom cranes and log & forestry cranes and does not include sea cranes, sales of commercial trucks or truck chassis. 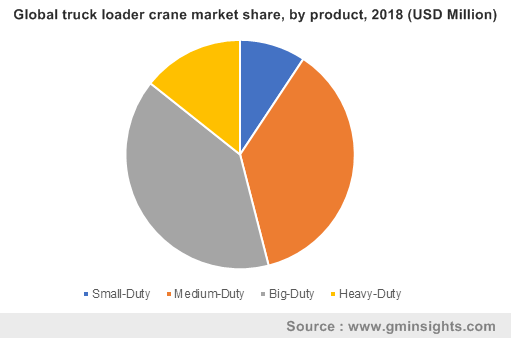 The truck loader crane market is undergoing a rapid development owing to the increased adoption of these machines in the construction, mining, oil & gas, and energy sectors. Due to the increasing infrastructure transformation activities, several construction machines including cranes are gaining a high demand across the globe. The construction companies have requirements of machines that perform efficient loading & unloading operations. As a result, crane manufacturers are getting several orders from construction players and rental providers, who cater to the low-investment consumer segment. Moreover, knuckle boom cranes are gaining high popularity among application industries such as mining and energy due to technical innovations including remote-control features and low energy consumption. These cranes support the digitization and environment-friendly initiatives adopted by construction companies, further adding to the market growth. Rapid urbanization and expansion of industrial sectors in Europe and Asia are creating a high demand for this equipment. Smaller industry applications including material handling, shipping, and transportation are undergoing speedy growth, creating the need for loader cranes to perform loading & unloading operations. The high popularity of e-commerce businesses in several countries including China, Germany, etc., is a major driver for the consumption of these cranes. Additionally, the leading equipment manufacturers are expanding their regional presence in untapped markets to gain a higher truck loader crane market share. In the past years, companies such as Hiab, Palfinger, and Tadano have entered into joint ventures and partnership strategies with various other local companies to start manufacturing in Asian countries, leading to the market expansion in the region. Small-duty models are gaining high popularity in the truck loader crane market owing to the lifting capacity features that cater to the general material loading, unloading, and handling applications in various industries. Such cranes are used at various sites for lifting & moving tires, huge cables, and placing various other items in the proper position. Small-capacity cranes are gaining more demand as compared to heavy-duty products as they can be easily installed on small & medium-sized trucks. Additionally, these cranes are gaining demand through rental channels owing to the need for such machines from consumers working on small projects such as residential construction, material handling at warehouses, etc., which adds up to the market. Heavy-duty cranes are increasingly being deployed in heavy material handling operations at lifting & transportation at construction, distribution, and logistics facilities. Several other applications of heavy-duty cranes, such as complicated installation tasks and rescue operations during natural calamities, are the major factors fueling the heavy-duty loader crane demand. Some of the leading crane manufacturers including Hiab, Palfinger, etc., are developing application-specific & technically-innovated cranes with mobile connectivity features, further contributing to crane market development. Rental end-use has a high demand for crane market owing to the requirement for low-cost machines from customers with limited monetary resources. Several construction companies and contractors have machine requirement for a lesser time period, compelling them to take cranes on a rental basis owing to the high investments required in new crane purchases. Moreover, rapidly-changing technologies and machine feature due to regular product launches are also factors supporting rental application growth. Several rental companies offer professional installation and maintenance services, which increase renting convenience with customers, further adding to truck loader crane industry growth prospects. In the market, energy end-use is witnessing a heavy demand owing to the utilization in the installation and maintenance of huge wind turbines, energy generation applications, etc. Several manufacturers are gaining orders from the energy sector due to the rapid development in the energy sector and the establishment of wind energy generation plants across the globe. Owing to the heavy lifting and loading capacities of heavy-duty cranes, these equipment are being utilized in energy applications to cater to the heavyweight lifting operations, further supporting truck loader crane market growth. The rising upgrades of public infrastructure facilities in Eastern European countries are driving truck loader crane market growth. Countries including Denmark. the Czech Republic, Romania, Bulgaria, Croatia, etc., are witnessing government and private investments for the development of buildings, railways, roadways, and other basic infrastructures. For instance, the favorable macroeconomic and political situations in Russia will support the completion of several infrastructure projects at a fast pace by 2020. Such developments coupled with the government’s support for the construction industry development are the major factors that will drive the product demand in the truck loader crane market. 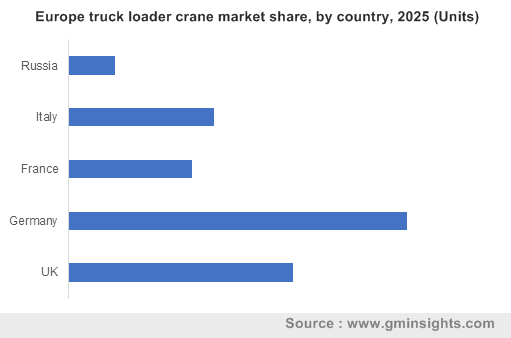 The truck loader crane market comprises few major manufacturers such as Hiab, Fassi, Hyva Group, Tadano Ltd., Palfinger AG, Liebherr Group, Manitex International, F.Lli Ferrari, etc. Palfinger AG and Hiab produce high quantities of machines and cover most of the crane market share. All these companies are heavily investing in R&D activities to develop highly efficient and technically-upgraded crane models. Manufacturers in the truck loader crane market are expanding their geographical presence and strengthening their business operations in untapped regions. For instance, in August 2017, Hiab announced the acquisition of Argos Guindastes Indústria e Comércio, a loader crane manufacturer in Brazil. The acquisition aided Hiab to make a strong entry in the Brazilian market and establish a foundation for crane business in the region. The adoption of various strategies by manufacturers and the demand from other application industries including energy, rental, etc., are supporting truck loader crane market growth. 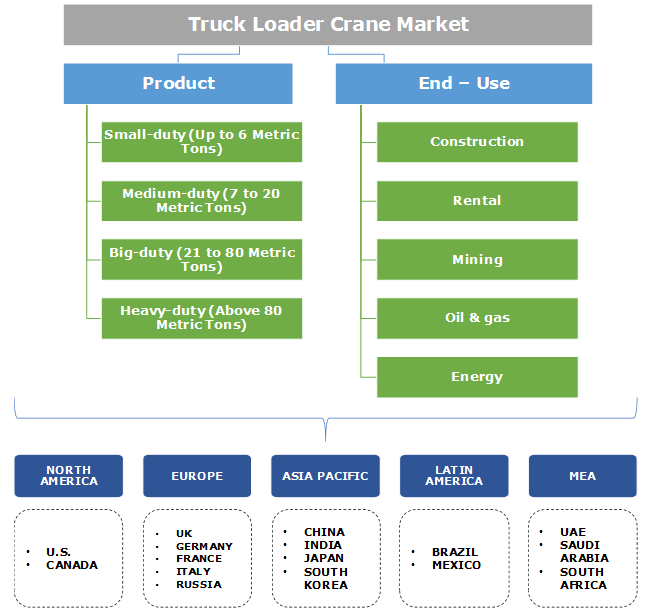 The truck loader crane market is consolidated with the presence of several small manufacturers across the globe. The machines are witnessing rapid technical changes by manufacturers such as the integration of remote-control features, lesser energy-consuming cranes, and training through augmented reality applications. Several companies in the truck loader crane industry are developing highly-efficient cranes that include these technologies to cater to more applications and provide easy accessibility to the operators. Additionally, manufacturers are developing strong distributor and dealer network across untapped markets to address the high consumer demand from smaller market segments.